When travelling through Delaware, please be sure to visit the Delaware Law Enforcement Officers Memorial, located on the Legislative Mall in Dover, Delaware. 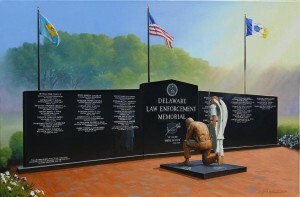 Law Enforcement Officers Memorial Becomes Reality! The Making of The Memorial. Read about the Artist, Rodger Brodin.